My currently inked pens have changed a lot recently, so I feel that it's a good time for another one of these. 1 & 2. Levenger L-Techs (Diamine Blue Velvet and Noodler's Black) - Very similar in appearance to the Rotring 600, these pens are two I recommend looking into if that style interests you. The nibs are among the smoothest in the sub-$100 range, so I alternate between these two as EDC pens. 3. Stipula Splash (Stipula Dark Red) - With all the bad reviews, I didn't expect to like this pen much; but it's actually very nice in person. 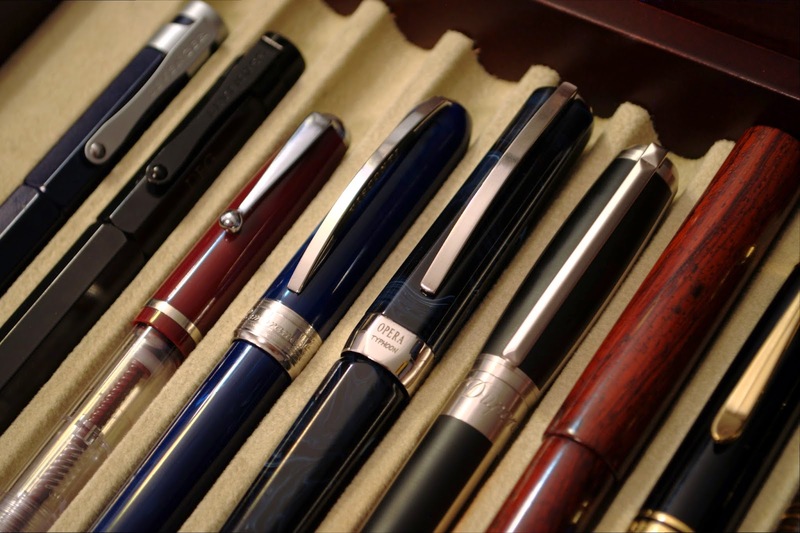 The piston is smooth and can hold a substantial amount of ink. 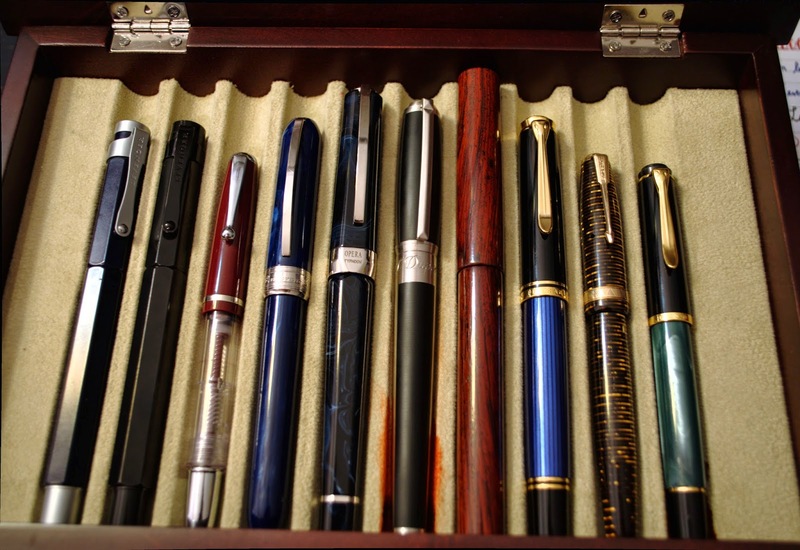 The nib also flexes more than most modern flex pens, and the feed keeps up very well; so there's barely any railroading. 4. Visconti Rembrandt (Levenger Blue Bahama) - A review of this pen has been in the works for a few months, but I haven't quite finished it. The resin used in the Rembrandt is truly beautiful; and although the nib is steel, it's still a very nice, wet writer. The cap system is magnetic, so it's great for quick notes. 5. Visconti Opera Typhoon (Diamine Regency Blue) - I received this pen as a Christmas gift recently, and it's quickly become one of my most used pens. At first, I didn't quite understand the double reservoir system; but after reading about it, its actually fairly easy to use. The snorkel attachment (picture) works well and makes filling from smaller bottles much easier. 6. S. T. Dupont D-Line (J. Herbin Lie de The) - This one has been in my collection for several months now, and it's been inked that whole time. Because S. T. Dupont's nibs tend to run broad, I chose an EF nib which wrote perfectly out of the box. 7. Fred Faggionato Le Geb (Diamine Silver Fox) - This pen is unique. I ordered it through a series of e-mails to Faggionato with Denis from La Couronne du Comte acting as an intermediary. 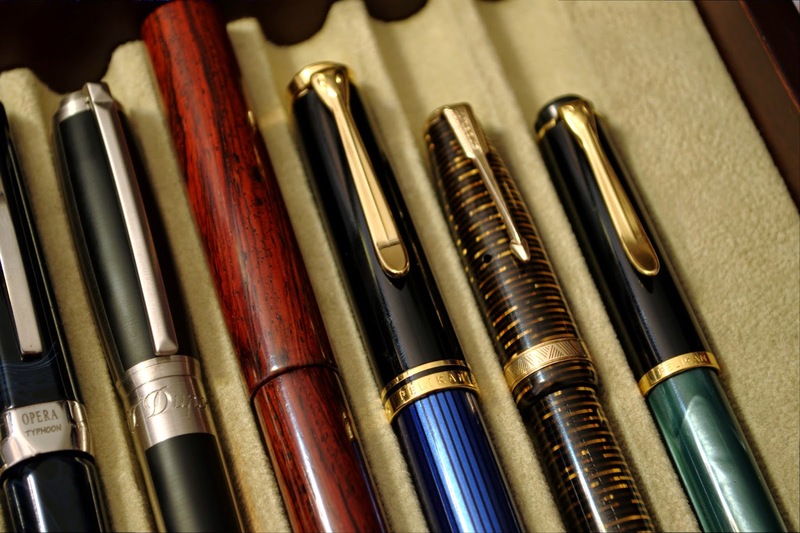 The Cocobolo wood used to make the pen is coated with a clear layer of urushi lacquer, giving it an appropriate premium feel and a shiny finish. The nib which came on this one is a fine semi-flex: it doesn't produce vintage line variation, but it's still impressive. To see more of Faggionato's work, visit his website or La Couronne du Comte. I'm considering doing a pictures post, but not a full review, for this one sometime next week. 8. Pelikan M800 (Diamine Safari) - The M800 was my first foray into broader nibs. 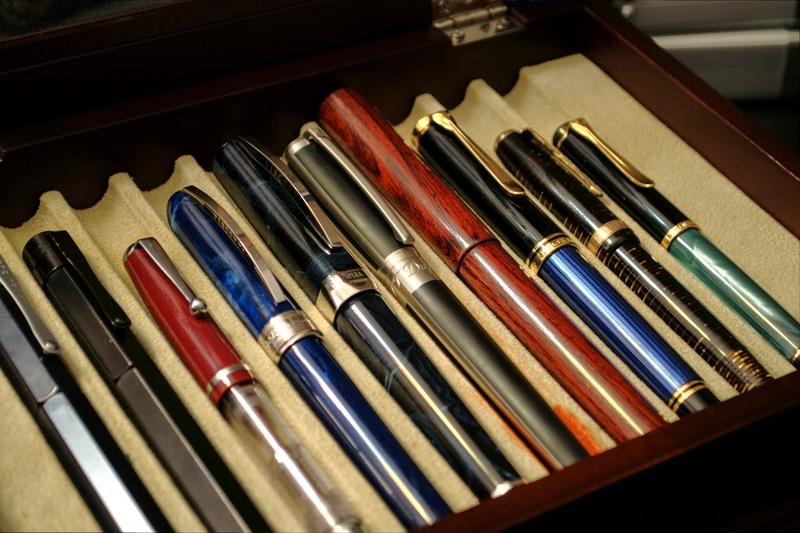 Since Pelikans have interchangeable nibs, it's a good, albeit expensive pen for that purpose. I was able to pick this one up for significantly less than the average U.S. price by ordering from CultPens. 9. Parker Vacumatic (J. Herbin Ambre de Birmanie) - This Vacumatic came from Peyton Street Pens along with a green pearl. The green one is currently soaking in water to be filled with a new ink. This gold one has a fine nib, which is smooth; but it writes more like an extra-fine. Regardless, it's still a good, but flashy, everyday pen. 10. Pelikan M200 (Diamine Tropical Green) - As this was my first pen, I try to keep it inked at all times. Right now, it's filled with the new Diamine 150th Anniversary Tropical Green which is a nice match for the Pelikan's green marbling. Its steel nib is springy and very pleasant to write with. Je freine pour stylos plume.